S-MicroW L is a temperature data logger from -40°C to 140°C (standard calibration from 25°C to 140°C, calibrable from 0°C to 250°C, only the probe will resist above 140°C. 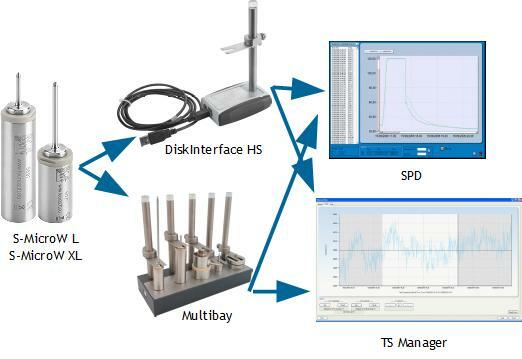 For calibrations above 140°C probe minimum length is 50 mm) with 20 or 50 or 100 or 150 mm or on demand length external probe (probes cannot be switched) on a 5 mm base (base height is not counted for probe length), managed with Windows software and USB interface (DiskInterface HS, Multibay). Battery is user replaceable and the data logger is provided with an Accredia (NIST equivalent) traceable cetificate on 6 points. For each version it is available the XL model too, S-MicroW XL, which has same diameter but is higher because it hosts a bigger battery for a longer life time.